^ a b c d Bellamy, D; Boyes, S; Dowsett-Lemaire, F; Gilardi, J; Hall, P; Hart, J; Hart, T; Lindsell, J; Michels, A; Phalan, B; et al. (2016). "Psittacus erithacus". IUCN Red List of Threatened Species. 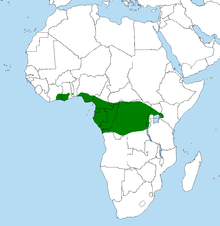 Version 2016-3. International Union for Conservation of Nature. Retrieved 9 December 2016. ^ Florida Fish and Wildlife Conservation Commission. "Nonnatives - Gray Parrot". Retrieved 28 June 2018. ^ Aydinonat, Denise; Penn, Dustin J.; Smith, Steve; Moodley, Yoshan; Hoelzl, Franz; Knauer, Felix; Schwarzenberger, Franz (4 April 2014). 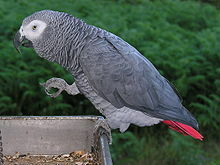 "Social Isolation Shortens Telomeres in African Grey Parrots (Psittacus erithacus erithacus)". PLoS ONE. 9 (4): e93839. doi:10.1371/journal.pone.0093839. ISSN 1932-6203. PMC 3976323. PMID 24705445.